The Rocket® LX™ CVS Needle Set has been developed with the assistance of a leading UK Fetal Medicine Unit and is the result of a 4 year program of continuous product development and design improvement. NEW LX™ LONGITUDINAL ECHO BEVEL DESIGN with in-line high resolution echogenic surface preparation to give smoother, easier tissue penetration with pinpoint ultrasound definition of the needle tip. INTEGRAL TUBING SET – purpose designed extension tube set is included in every pack for simple, safe attachment to the needle without the need to find costly off-the-shelf items which cannot offer guaranteed compatibility and security. 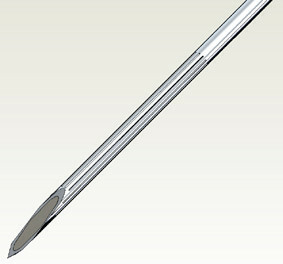 HUB MARKINGS ensure correct orientation of the inner stylet following removal and replacement at any time during the procedure.